When Salvador Alvarenga washed up on the shore of a South Pacific island some 438 days after the fishing boat he was in broke down off the coast of Mexico, the world urgently wanted to know what happened. One of the biggest questions involved his crewmate who died somewhere along the line. How did he die? Had the survivor resorted to cannibalism to stay alive? Once the news cycle had moved on to the next viral story of the day, Alvarenga was largely forgotten. But not by one intrepid reporter. 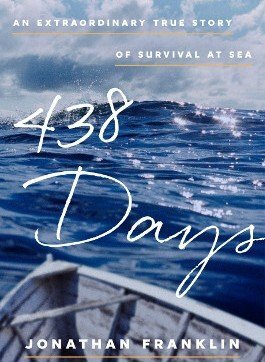 Jonathan Franklin, who’s recent book 438 Days: An Extraordinary True Story of Survival at Sea, represents the first complete telling of this miraculous story. Franklin, who had previously wrote a book about the Chilean miners, said he waited nearly five months to make contact with Alvarenga. A stringer for The Guardian at the time, Franklin speaks fluent Spanish and lived in Latin America for 18 years. He earned the book rights to Alvarenga’s story, proceeds of which he will share with the survivor. There may even be a movie. Over the next eight months, Franklin interviewed Alvarenga at his home in El Salvador nearly 30 times. He said it was hard for the survivor to recount some of the details, like how he spoke to his companion’s corpse for five days before snapping out of it one day and lowering his body into the ocean. Some days he could only talk about it for a half hour at a time before needing a break. He reported getting headaches and not being able to sleep at night. One important detail Franklin sorted out: Alvarenga likely did not eat his crew mate who died about a month into the drift. To survive, Alvarenga ate fish, birds and turtles, drinking turtle blood in place of water. We spoke with Franklin from his home in Santiago, Chile recently about how he secured one of the only interviews with the notorious fisherman and what he learned about what it takes to survive. Q: Were you convinced that he did not eat his crew mate? Franklin: I thought his answer pretty reassuring. He didn’t say I wouldn’t. it wasn’t a moral question. He said at that point he wasn’t starving. He had turtles, dried fish and birds. He said I didn’t need food. He talked pretty elaborate description about how he tried to save the guys life. He said it wasn’t necessary to eat him. When I asked him if he was capable of it he kind of hemmed and hawed a bit talking about how difficult it would be. He was really practical about it. Saying the guy was so skinny he didn’t have any meat on him. So he didn’t eat him. Q: We read there was a lawsuit by the crewmate’s family accusing Alvarenga of eating him? Q: What is it about these stories that are compelling? Franklin: I’m totally convinced that mammals are not supposed to be staying in cubicles and we have this deep instinct to kind of live on the edge. Even if we can’t all do it ourselves but to vicariously live on the edge of life and death, it’s almost like a mythological challenge, I think at some level in our DNA we crave. Look at all the reality shows, people love that stuff. So when you get a real story that didn’t happen in 1890, this happened last year. That’s one thing that attracted me. You kind of think that these epic survival tales are something of the past, especially something as simple as a man and a boat and an ocean. You would think we’ve seen all the permutations of that, but apparently not. Q: What do you think it was that contributed most to his survival? Franklin: He had almost everything going for him. He was really experienced, really strong, not too big, so he didn’t need tons of calories, good age, in terms of body type he was right where you want to be. But mainly it’s his head, the guy is totally positive. The other day I asked him if he was going to go fishing. He said he was going to stay 15-20 miles off shore so that if his boat breaks down he can swim to shore. Q: What was something that surprised you about the story? Franklin: I thought it was so cool that he created this alternative world. He was able to almost hypnotize himself into thinking he was on land. Or he would be eating shark liver and imagining it was a great home cooked meal. He was always taking this terrible situation and hypnotizing himself to thinking everything was ok. And for him it really worked. He really had this ability to create an alternative reality. Q: Do you think you could make it? Franklin: I would never make it. Now when I have a problem I can’t solve, I think what would Alvarenga do. He would figure it out.